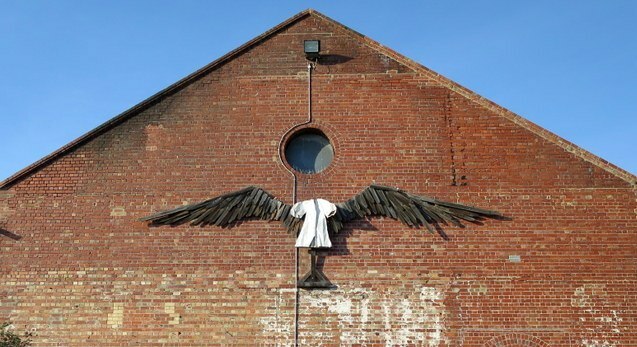 The Angel artwork was made for this wall. Or so I thought until attending an exhibition of Sione Francis’ latest work at Gasworks. 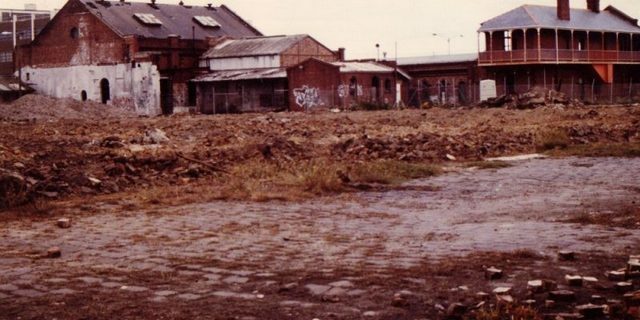 As Gasworks made its transition from dereliction to Arts Park in the ’90s, a sculpture exhibition was held in the Park. Francis entered his work, Angel. The beneficent artwork stood out from among the exhibits for then Mayor of South Melbourne, Frank O’Connor, and it was gifted to Gasworks. It expressed what the Council of the day was trying to bring about – a sense of place, connection and community. Francis had already exhibited the work elsewhere, but it had found its home. It has sustained the life of the Park ever since and become known as the Guardian Angel of the Park. In his quiet remarks, Francis kept returning to the words that in his work and in his life, he is ‘Finding a place to stand’. Sione Napi Francis is a Tongan Australian artist. Tonga is one of the Pacific Island nations whose very existence is threatened by climate change. It was the advocacy of these small island states that led to that most important second part of the Paris Climate Accord in 2015 “to pursue efforts to limit the temperature increase even further to 1.5 degrees Celsius”. Soon Gasworks will host its popular outdoor sculpture exhibition From Nature. The exhibition will coincide with the next international meeting in Bonn to track progress towards the Paris Climate Agreement – COP23. The President of COP23 is Fiji’s Prime Minister, Frank Bainimarama. “We have no time to waste” he said in a recent address to the UN General Assembly, “we are all in the same canoe”. Having a President from a small island nation is intended to highlight the immediate and grave threats faced by small island nations from rising sea levels and intense weather events. In island states most people live very near to the coast and most vital infrastructure is located on the coast. Fresh water supplies and fish stocks are also threatened. This week Tony Abbott said in a speech in London that climate change could be doing more good than harm, and the government appears to be walking away from the Clean Energy Target as recommended by Australia’s Chief Scientist, Alan Finkel. ‘Finding a place to stand’ holds many meanings at this time. Who do we stand with and what do we stand (up) for? A Place to Stand – an exhibition of the work of Sione Francis at Gasworks Arts Park from 3 to 29 October. Read Prime Minister Frank Bainimarama’s speeches in the lead up to COP23.